This is actually sort of a filler episode, Ritsuka wants to go out on Sunday and play with his friends without Soubi, and orders Soubi to stay away from him for the day. And Soubi passive aggressive little bugger that he is follows Ritsuka around with his friends and stalks him basically. The episode is broken up into different parts and are all from different points of view, including some of the minor characters. Needless to say Soubi only gets caught cause he reveals himself to Ritsuka out of jealousy. Hee hee super cute, and a nice light helping of fluff before the darkness of the finale. This episode much like Episode 1, 2, and 12 has two character designers. Both of which had character design credits to their name before taking up animation direction for this episode. 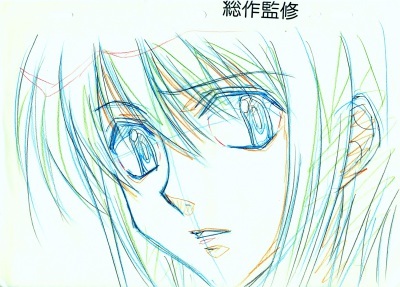 Hino Takafumi also provided Animation Direction for episode 1 as well it will be interesting to see if I can parse out which corrections belong to which director along with whatever corrections I can find from Nakayumi-sensei. 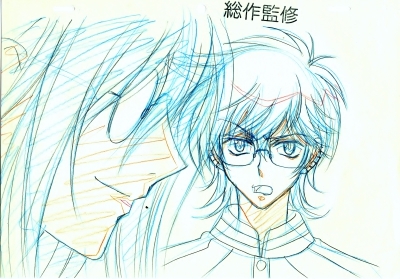 I have only two genga sets from the episode one of Soubi and Kio and one of Ristuka's creepy psychiatrist.